This is a phrase of some importance in discussing strategy. It implies that a group (quite often a single stone) may come under attack, but in such a way that the attacker finds it difficult to take a large profit from an actual capture. it is hard to give up a small group because the total loss of territory would be large. 3. it is hard to give up a small group because it keeps two opponent groups separated. Charles It's a good comment: see divide and conquer. Perhaps point (2) should be stated more generally, as in 'the total loss of QARTS judgement would be too large'. Another closely related idea is the open skirt. Since it is bad to defend territory open on two sides, it is probably good to allow an attack on a stone that has several rescue routes. Those don't have to be used to escape: in fact that can risk increasing a loss. They can be used 'from the other end': reach out to an attacked stone and thereby reduce the scale on which it might be captured. Note that such plays, pushing in from outside, are likely to be sente, while rescuing anything tends to be gote. Charles Yes, I see this kind of thing quite often. The cap has a million variations, and I disapprove of learning them as joseki. But here's a general idea. 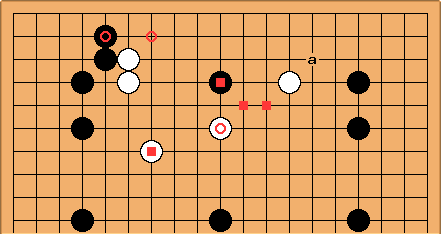 After , whether or not it was good, Black has made an open skirt for the area White is trying to create around . Until White has prevented Black jumping in at the circled point, Black shouldn't worry too much about . Black has an escape route (squares) and the angle play at a (good only if is a sacrifice). But right now any capture White could make would be small.